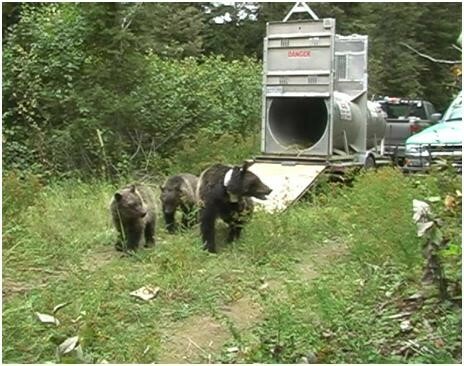 Grizzly bears relocated to the North Cascades would be captured in culvert traps, fitted with GPS collars and released, like this female grizzly and cubs. Grizzly bears would be captured and released into the North Cascades in order to restore the bears to their historic habitat, based on proposals detailed in an environmental study released last week. The grizzly bear restoration proposals are described in a draft Environmental Impact Statement (EIS) from two federal agencies leading the effort to restore the bears to the North Cascades. 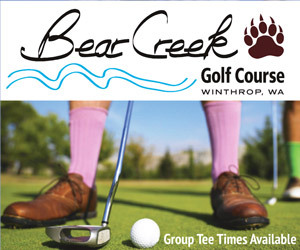 Alternatives for restoring grizzlies will be presented to the public in a series of informational open houses, including one at the Winthrop Barn on Feb. 15, from 6-8 p.m. The draft EIS describes three alternatives that would each work toward establishing a population of 200 grizzly bears by relocating bears from other areas into the North Cascades Ecosystem — an area about the size of Vermont that encompasses 9,800 square miles in Washington state and another 3,800 square miles in British Columbia. The U.S. portion of the ecosystem includes the Okanogan-Wenatchee National Forest (including the Methow Valley Ranger District), North Cascades National Park, Ross Lake National Recreation Area, Lake Chelan National Recreation Area, and Mt. Baker-Snoqualmie National Forest. In addition to the three proposals to restore grizzlies to the North Cascades, the draft EIS includes a required “no action” alternative that would maintain the status quo, which is the absence of a sustainable grizzly bear population in the North Cascades. The study of grizzly restoration is led by the National Park Service (NPS) and the U.S. Fish and Wildlife Service (FWS), working with other federal and state agencies. The release of the draft EIS starts a 60-day public comment period that ends March 14. The full draft of the EIS and instructions on how to comment are available at parkplanning.nps.gov/grizzlydeis. The grizzly bear (Ursus arctos horribilis) was listed as threatened under the federal Endangered Species Act in 1975. Following the listing, FWS initiated a recovery effort to establish viable populations in six “recovery zones” in the United States, one of which is the North Cascades Ecosystem (NCE), according to the draft EIS. 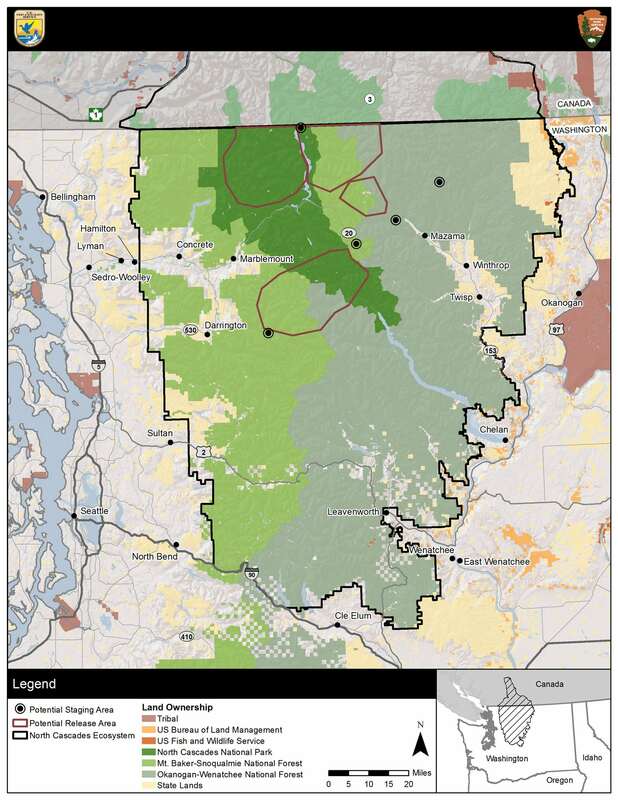 Fish and Wildlife Service Potential grizzly bear staging and release areas in the North Cascades included in the Draft Environmental Impact Statement. Click graphic to see map at a larger size. The NCE is a vast wilderness landscape that spans the crest of the Cascade Range and comprises one of the most intact wildlands in the contiguous United States. Historical records show that grizzlies roamed the area before they were decimated by hunting and loss of habitat over the past two centuries. Research conducted last year indicates the “carrying capacity” of the Washington portion of the ecosystem is approximately 280 bears, according to the draft EIS. Although the actual number of grizzlies in the NCE is not known, it is “highly unlikely that the area contains a viable grizzly bear population,” the draft EIS stated. There have been only four confirmed detections of grizzly bears in the greater NCE in the past decade, all of which occurred in British Columbia and may comprise only two bears. There is no confirmed evidence of grizzly bears in the U.S. portion of the NCE since 1996, according to the draft EIS. • Avoid permanent loss of grizzly bears in the NCE. • Contribute to restoring biodiversity of the ecosystem for the benefit and enjoyment of present and future generations of people. • Enhance the probability of long-term survival of grizzly bears in the NCE and contribute to overall grizzly bear recovery. • Support recovery to the point where grizzlies can be removed from the federal list of threatened and endangered species. Each of the three action alternatives described in the draft EIS would seek to restore a “self-sustaining population of 200 bears through the capture and release of grizzly bears into the NCE,” according to information from NPS and FWS. Each alternative would involve a similar approach to capturing, transporting and releasing grizzly bears. They also call for enhanced public education and outreach, and provide guidelines for responding to conflicts between humans and grizzly bears. The alternatives also describe approaches for replacing bears that die, releasing additional bears, managing access to areas where bears are released, and habitat management. The grizzly bears brought to the NCE would likely come from northwestern Montana or south-central British Columbia. Any bears that die or move out of the NCE would be replaced, according to the study. The alternatives differ primarily in the timeframes they would follow for reaching the desired population of bears. • Alternative A — Continuation of Existing Grizzly Bear Management (No Action). This would not implement any new management action, limiting options for grizzly bear restoration. • Alternative B — Ecosystem Evaluation Restoration. NPS and FWS would implement an ecosystem evaluation approach to grizzly bear restoration, providing for release of up to 10 grizzly bears at a single remote site on NPS or U.S. Forest Service lands in the NCE over two consecutive summers. The bears would be monitored for two years to evaluate habitat use and instances of conflicts with humans. In the fourth year a decision would be made regarding how restoration would proceed during subsequent years. That could involve repeating the release of an additional 10 bears, or a decision to transition to Alternative C.
• Alternative C — Incremental Restoration. Five to seven bears would be released into the NCE each year over a period of five to 10 years, with a goal of establishing an initial population of 25 grizzly bears. Bears would be released at multiple remote sites on national park and forest lands, located in close proximity to facilitate interaction and breeding among the relocated bears. This alternative would be expected to achieve the goal of 200 grizzly bears within 60 to 100 years. • Alternative D — Expedited Restoration. The lead federal agencies would expedite grizzly bear restoration by releasing additional grizzly bears into the NCE over time, until the restoration goal of 200 bears is reached. This alternative would be expected to achieve that goal within about 25 years. This alternative would not limit the primary restoration phase to 25 animals and would not set a limit for the number of bears released each year into the NCE. Instead, the number of suitable grizzly bears captured in a given year would be released — likely five to seven bears per year. Capture and release would continue each year until the combination of release and reproduction results in a population of approximately 200 grizzly bears. Like Alternative C, bears would be released at multiple remote sites on federal lands based on habitat criteria. The federal agencies leading the study did not indicate any alternative as the preferred approach. The draft EIS noted that Washington state law prohibits state wildlife officials from reintroducing grizzly bears from outside Washington. However, state law directs the Washington Department of Fish and Wildlife to “fully participate in all discussions and negotiations with federal and state agencies relating to grizzly bear management,” and does not prevent federal agencies from transplanting bears into the state, according to the draft EIS. Bears would be captured in culvert traps and transported by helicopter to release areas in the North Cascades. The bears would be fitted with GPS collars before release, the draft EIS said. Relocating the bears would require helicopter trips into wilderness areas. Each release could take up to eight hours (one day) depending on the distance between staging and release areas, potentially resulting in five to 10 days of helicopter use per year for releases. A map of proposed release areas in the draft EIS shows potential release areas in the North Cascades to the west and northwest of the Methow Valley. Proposed staging areas listed in the draft EIS are Eight Mile (Billy Goat), Hozomeen, Swamp Creek Pit, Green Mountain and West Fork Methow. The study addresses impacts of reintroducing grizzly bears on other wildlife and fish; on the wilderness character of the North Cascades; on visitor use and recreation; on public and employee safety; on socioeconomics; and on ethnographic resources — including the importance of grizzly bears to tribal culture and history. Similarly, wilderness character would be briefly impacted by the flights, with long-term benefits from restoring a native species to the ecosystem. Proposed restoration of grizzly bears into the North Cascades has raised concerns about safety risks to backcountry recreation visitors, the draft EIS said. There are also safety concerns for the employees involved in bear capture and release. But the study found those risks were outweighed by the benefits of restoring the species. Tourism in the area could be impacted both positively and negatively by the presence of grizzly bears, the study said. Providing residents and visitors with an opportunity “to again experience grizzly bears in their native habitat” is one of the objectives of the restoration proposal. That opportunity might attract some visitors, but deter others, the study said. Release of the draft EIS was welcomed by conservation organizations that support grizzly bear restoration in the North Cascades. “Grizzly bears are highly intelligent, charismatic animals. For many Northwesterners they are the very embodiment of wildness,” said Joe Scott of Conservation Northwest. The public is invited to participate in a series of informational open houses and webinars about grizzly bear restoration hosted by the National Park Service and U.S. Fish and Wildlife Service. The open houses are part of the public’s opportunity to comment on a draft Environmental Impact Statement (EIS) describing proposed alternatives to restore grizzly bears to the North Cascades Ecosystem. Renton — Feb. 24, Renton Community Center. Webinars are scheduled for Tuesday, Feb. 14, 11 a.m.–1 p.m. and Feb. 26, 5–7 p.m. The release of the draft EIS last week opens a public comment period that ends March 14. Comments will be considered in developing a final Environmental Impact Statement. The draft EIS and instructions on how to submit written comment are available at parkplanning.nps.gov/grizzlydeis. To register for the webinars click on the “Meetings” link.